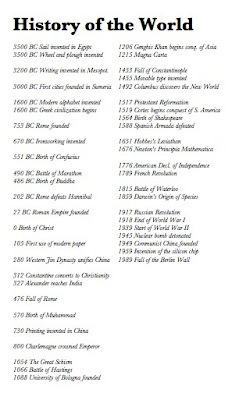 Here's a timeline of the history of the world that you can print on an index card and stick in your pocket. You never know when it might come in handy. You might be visiting a university and one of the professors invites you to try out a time machine – how will you know what year to choose? If you have this card on hand, it is not a problem – at a glance you know when to visit Genghis Khan's conquest of Asia, or the invention of the sail. The dates come from here. posted by Jonathan at 6/24/2011 10:49:00 p.m.
By riffraff, at 7/02/2011 3:32 a.m. Thanks riffraff - that one should have been BC, not AD - fixed! By Jonathan, at 7/21/2011 7:12 p.m.